T-Rex: A Prehistoric Family Adventure, A Place to Eat, Shop, Explore and Discover is scheduled to open at Downtown Disney on October 14, 2008. T-Rex, developed by Schussler Creative, Inc., and operated by Landry's Restaurants, Inc., features dining and retail in a 30,000-square-foot, 600-seat interactive prehistoric environment. The concept is built around water, fire and ice: Guests will be greeted with life-size animatronic dinosaurs that live among cascading waterfalls, bubbling geysers, a fossil dig site and much more. There will be a meteorite shower every 20 minutes and an aqua bar complete with a 6,000-gallon shark tank and a large octopus with mechanical tentacles. A full-size skeleton replica of Argentinosaurus, one of the largest of the dinosaurs and copied from a museum specimen about 125 feet in length, looms over the entrance, joined by a Tyrannosaurus rex skeleton. The theme carries over to the menu, which features items with names such as Caesarsaurus (Caesar salad), Raptor Ribs (Asian BBQ ribs), Pterodactyl Wings (Buffalo chicken wings), Triassic Tortellini (tri-colored cheese tortellini) and Gigantosaurus Burger (think really big hamburger). You will be able to make reservations by calling 407-WDW-DINE (939-3463). 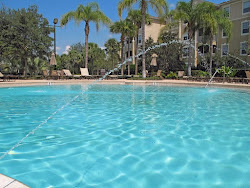 This seems to be an incredible source for Orlando Villas,Florida Villas discounts and savings that will make your trip affordable and fun for Florida vacations.I had been relying on http://www.Floridadreamvillas.net earlier and they too offered good stuff.